The great cities of Europe at the height of the Renaissance�a place where enlightened thought is paired with astounding feats of architecture, sculpture, and painting. It is an age of great change in the world, but above all else, it is an age of undeniable splendor. For years, you�ve reveled in the diamond-hard puzzles of Splendor, one of the most award-winning board games of all time. 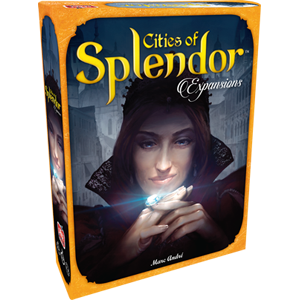 Now, Space Cowboys is proud to present a new expansion: Cities of Splendor. In Cities of Splendor, you�ll leave the comforting familiarity of the European gem trade and travel to the Orient, where new rules and cards invite you to adapt your strategies. With four expansions in a single box, Cities of Splendor offers you four thrilling new ways to experience the game, opening the door to new levels of replayability without sacrificing any of the original game�s unique elegance. Each expansion is added to the basic game and they should be played separately. The Trading Posts are special bonuses you earn by acquiring an array of development cards: more prestige points from the 1st noble tile you receive, an extra token when you choose the "Take 2 gem tokens of the same colour" action, and so on.